Microbiology is the study of microorganisms (microbes), which are organisms (forms of life) that are microscopic; that is, too small to be visible to the naked or unaided human eye. Microorganisms can be bacteria, fungi, archaea, or protists. Microorganisms are often described as single-celled, or unicellular organisms; however, some unicellular protists are visible to the human eye, and some multicellular species are microscopic. Although viruses and prions are not considered microorganisms, because they are generally classified as non-living, they are also subjects of study in microbiology. People that study the field of microbiology are known as microbiologists. Human curiosity, creativity, reason, and heart has been brought to bear on the study of microorganisms, making numerous important contributions. Among these are understanding the role of microbes in disease, developing antibiotics and vaccines, and bringing awareness of the importance of hygiene and means to avoid insect vectors; understanding food spoilage; helping to explicate the beneficial role of microbes in health, nutrient cycling, and food chains; and utilizing microbes in industrial production and scientific research. Although much is now known in the field of microbiology, advances are being made regularly. The most common estimates suggest that we have studied only about one percent of all of the microbes in any given environment. Thus, despite the fact that over three hundred years have passed since the discovery of microbes, the field of microbiology is clearly in its infancy relative to other biological disciplines such as zoology, botany, and entomology. Anton van Leeuwenhoek (1632 - 1723), was a Dutch tradesman who is well known for his contribution towards the establishment of microbiology and for improvements to the microscope. Known as "the Father of Microbiology," Leeuwenhoek, using his handcrafted microscopes, was the first to observe and describe single celled organisms that he first referred to as animalcules, and which we now refer to as microorganisms. In 1676, Leeuwenhoek first recorded microscopic observations of bacteria. 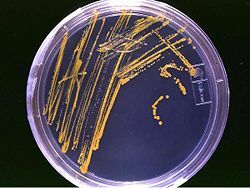 Years after Leeuwenhoek's discovery, in 1828, Christian Gottfried Ehrenberg introduced the name "bacterium," derived from the Greek word βακτηριον meaning "small stick." During his lifetime, Leeuwenhoek also observed microscopic nematodes and rotifers, in addition to such structures as spermatozoa and blood cells. Like Galileo in astronomy (who also used improved optical technologies), Leeuwenhoek's early discoveries in the field of microbiology overturned traditional beliefs and theories and was met with strong skepticism and resistance to the inevitable conclusions. However, van Leeuwenhoek's main opposition was from the scientific community, not the religious community, as was the case for Galileo, because Holland was freer of religious persecution than many other European nations at the time. Ultimately, Leeuwenhoek was more fortunate than Galileo in that his discoveries were eventually widely accepted and applauded in his lifetime, whereas Galileo's were not. While Leeuwenhoek is often cited as the first microbiologist, the first recorded microbiological observation, that of the fruiting bodies of molds, was made earlier in 1665 by Robert Hooke. Louis Pasteur (1822-1895) and Robert Koch (1843-1910) were contemporaries of Cohn’s and are often considered to be the founders of medical microbiology. Pasteur is most famous for his series of experiments designed to disprove the then widely held theory of spontaneous generation, thereby solidifying microbiology’s identity as a biological science. Pasteur also designed methods for food preservation (pasteurization) and vaccines against several diseases, such as anthrax, fowl cholera, and rabies. Robert Koch is best known for his contributions to the germ theory of disease, proving that specific diseases were caused by specific pathogenic microorganisms. He developed a series of criteria that have become known as Koch's postulates. Koch was one of the first scientists to focus on the isolation of bacteria in pure culture resulting in his description of several novel bacteria including Mycobacterium tuberculosis, the causative agent of tuberculosis. While Louis Pasteur and Robert Koch are sometimes considered the founders of microbiology, their work did not accurately reflect the true diversity of the microbial world because of their exclusive focus on microorganisms having medical relevance. It was not until the work of Martinus Beijerinck (1851-1931) and Sergei Winogradsky (1856-1953), the founders of general microbiology (an older term encompassing aspects of microbial physiology, diversity, and ecology), that the true breadth of microbiology was revealed. Beijerinck made two major contributions to microbiology: the discovery of viruses and the development of enrichment culture techniques. While his work on the Tobacco Mosaic Virus established the basic principles of virology, it was his development of enrichment culturing that had the most immediate impact on microbiology by allowing for the cultivation of a wide range of microbes with wildly different physiologies. Sergei Winogradsky was the first to develop the concept of chemolithotrophy (use inorganic compounds for aerobic or anaerobic respiration) and to thereby reveal the essential role played by microorganisms in geochemical processes. He was responsible for the first isolation and description of both nitrifying and nitrogen-fixing bacteria. Microbial physiology: The study of how the microbial cell functions biochemically. Includes the study of microbial growth, microbial metabolism, and microbial cell structure. Microbial genetics: The study of how genes are organized and regulated in microbes in relation to their cellular functions. Closely related to the field of molecular biology. Veterinary microbiology: The study of the role in microbes in veterinary medicine. Environmental microbiology: The study of the function and diversity of microbes in their natural environments. Includes the study of microbial ecology, microbially-mediated nutrient cycling, geomicrobiology, microbial diversity, and bioremediation. Characterization of key bacterial habitats such as the rhizosphere and phyllosphere. Pharmaceutical microbiology: the study of microorganisms causing pharmaceutical contamination and spoilage. A major contribution of microbiology has been learning the role of microbes in disease. It is now known that bacteria cause diseases such as plague, tuberculosis, and anthrax; protozoans cause diseases such as malaria, sleeping sickness, and toxoplasmosis; fungi cause diseases such as ringworm, candidiasis, and histoplasmosis; and viruses cause diseases such as influenza and yellow fever. Host-parasite relationships have been worked out, such as understanding that Plasmodium (cause of malaria) utilizes Anopheles mosquitoes in transmission; some Trypanosoma species (cause of African trypanosomiasis, or sleeping sickness, and Chagas disease, or South American trypanosomiasis) utilize the tsetse fly or conenose bugs; and Leishmania (cause of lieshmania) is carried by sand flies. Because of these findings, microbiologists have been able to develop antibiotics and vaccines, and the public has become aware of the importance of hygiene and means to avoid insect vectors (repellents, mosquito nets, etc.). However, while microbes are often viewed negatively due to their association with many human illnesses, only a small fraction of microorganisms are agents of disease (Paustian and Roberts 2007). Microbiology has helped humanity to understand the many important beneficial roles that microbes play in health, nutrient cycling, and food chains, and microbiologists have learned how to utilize microbes in industrial production and scientific research. For example, microbiologists have detailed how bacteria in human intestines and on skin help in preventing infection with harmful microbes and those in the intestine aid in digestion and provide needed vitamins, such as B12 (Paustian and Roberts 2007). The role of symbiotic bacteria and protists in many even-toed ungulates (cattle, deer, goats, and sheep) has been shown essential to allow them to break down cellulose, the most abundant organic compound on earth, into a form of carbohydrate that can be digested. Likewise, microbes have been show to be critical to nitrogen fixation, and most species of legumes provide a habitat for nitrogen-fixing bacteria, and receive a usable form of nitrogen as a benefit. Microbiology has detailed how abundant microbes are and how they are critical to food chains and decomposing dead plants and animals, releasing their nutrients for reuse. Microscopic algae provide oxygen. Prior to the work of microbiologists, people did not understand why food spoils. The identification of the role of microbes in food spoilage also has led to improvements in preserving food. 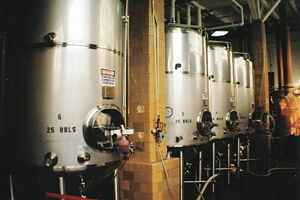 Microorganisms also are used in industrial fermentation (e.g. the production of alcohol and dairy products) and for antibiotic production. Many microorganisms are important research organisms, and scientists have utilized their knowledge of microbes to produce biotechnologically important enzymes and utilized and even genetically engineered microorganisms to help in removal of wastes, such as oil spills. Madigan, M., and J. Martinko, (eds.). 2005. Brock Biology of Microorganisms. 11th ed. Prentice Hall. ISBN 0131443291. Paustian, T., and G. Roberts. 2007. Through the Microscope: A Look at All Things Small. 'University of Wisconsin-Madison. Retrieved February 27, 2007. Ryan, K. J., and C. G. Ray, (eds.). 2004. Sherris Medical Microbiology. 4th ed. McGraw Hill. ISBN 0838585299. This page was last modified on 3 October 2018, at 16:46.